The combination of increased demand and financial pressures has forced health services to explore new and innovative methods of delivery at minimum cost. The internet and connected devices offer one potential solution to this challenge, which governments have begun to recognise, encouraging the use of digital services (see Australia’s digital hospital ) and internet mental health services in Norway and Sweden . However, it is unclear to what extent these initial steps are exploiting the digital potential in some countries. In the UK, according to a survey published in 2014, only 2% of the population reported any digitally enabled transaction with the National Health Service (NHS) despite an estimated 59% of UK citizens possessing a smartphone and 84% of adults using the internet . In England, the under-use of digital platforms in the NHS has been recognised by the publication of a five-year plan to reshape care delivery and utilise technology in the delivery of all kinds of health care . 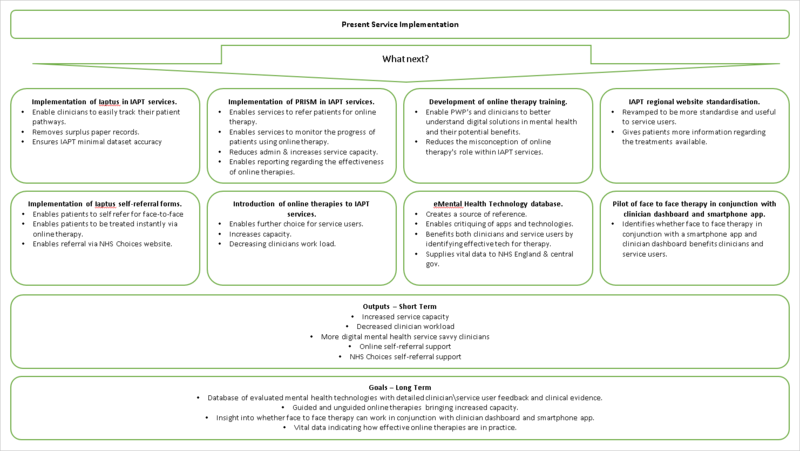 The landscape of digital mental health service provision in the NHS is not well delineated. This can be attributed to several factors: inadequate reporting; changing service recommendations; nationwide reorganisations of service provision infrastructure; and the rapid development and growth of the digital sphere itself. What is clear, though, is the increasing need for such services: a 2014 survey suggested that one in ten people in England wait more than a year for mental health assessment , and in the UK as a whole it is estimated that by 2030 there will be 2 million more adults with mental health problems . Digital mental health services have the potential to reduce waiting lists, make treatment more cost effective, reduce the time and expense of travel, stimulate self-management [3,4] and decrease the workload of mental health professionals [5,6]. This proposal details the actions that need to be taken for X IAPT services to fully utilise digital mental health services. Implementing these actions will enable the Trust to generate vital data needed by NHS England and central government regarding digital mental health services and their effectiveness. The following will be implemented across all X IAPT locations to ensure maximum digital accessibility in preparation for phase 2. Ensure that the iaptus platform is implemented within all X IAPT service locations. The system helps clinicians to easily track their patient pathways, removes surplus paper records and ensures IAPT minimal dataset accuracy. Cost: Potentially already paid for. Ensuring that the Child and Adolescent Mental Health Service (CAMHS) within X uses iaptus CYP. There is presently a large gap in CYPMH data collection countrywide. Using iaptus CYP will help set an example for other CYPMH services. Implement PRISM across all IAPT services. Prism enables services to refer patients for online therapy and to monitor their progress and outcomes directly within the patient record, without creating further administrative work. The system helps to reduce administration and increases capacity of therapists, while reducing overall waiting times by offering immediate treatment to suitable patients. A training course will be designed to improve clinician (PWP) understanding of digital solutions in mental health and their potential benefits. IAPT regional websites – evaluation, standardisation and enhancement. X IAPT regional websites presently offer differing levels of information regarding their service, along with self-help materials. The websites will be revamped to be more standardise and useful to service users detailing: Information about the service and what problems it can help the service user with, what treatments are on offered, resources and links (such as self-help materials) and how to contact the service. Sites will also implement iaptus self-referral forms to allow service users to directly refer online without the need to speak directly to someone directly. All regional websites will implement iaptus self-referral forms to give services users the option to self-refer online. The iaptus self-referral module will also enable service users to self-refer to X services via NHS choices. Introduction of online therapies to IAPT services. The introduction of one or more online therapies to IAPT services as a therapy choice for service users such as the Silver Cloud or Mind District platforms that allow clinicians to develop their own IAPT courses. A system built in conjunction with clinicians to enable smartphone apps, online resources and other technology based services to be logged as being used to aid patients between therapy sessions. Patients will be invited to feedback about these and comment on whether they found them helpful. Clinicians within IAPT will begin to examine smartphone apps, wearables and other devices they believe could be beneficial to their service users. These devices will be logged in a technology database accessible to every clinician. Clinicians will be given the ability to search the database for apps they can offer service users. A synonymised link between the service user’s record / outcome measures and the technology being used between sessions will be created to allow efficacy reporting. The Pacifica smartphone app offers its users daily tools for stress and anxiety alongside a supportive community. Based on Cognitive Behavioral Therapy & Meditation. What is unique to the app is that it can be integrated as part of face to face therapy, allow patients to complete homework and feedback NHS based scales such as the PHQ-9 scale all of which can be viewed via a clinician dashboard. A pilot to examine the potential benefits of the app and dashboard to clinicians and service users will be carried out. 1 We Need to Talk coalition. We still need to talk: a report on access to talking therapies. 2013. Does it need a behavior change/PR/Marketing component? Are there ways of comparing uptake, engagement and impact across the different online tools? Are there ways to ensure this uses the opportunities of web 2.0+? All the things you mention should be considered by the NHS. However there seem to be some objections to the idea of the NHS using PR/Marketing directly. I hope people read this and choose to implement some of the ideas if nothing else!